There was only one Paul Robeson. Ranking among the few real renaissance men of the twentieth century he was an accomplished athlete, lawyer, singer and actor. His notable roles include Shakespeare’s Othello and O’Neill’s Emperor Jones. His singing made him an international star in an age long before stardom itself became an industry. What’s more, as an outspoken civil rights activist, Communist and trade unionist, Robeson embodied the collision of art and politics. “The artist must elect to fight for freedom or slavery,” he said. “I have made my choice. I had no alternative. The history of the capitalist era is characterized by the degradation of my people”. 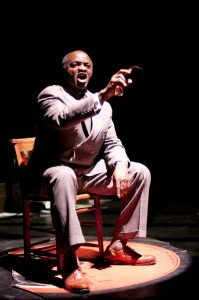 Robeson’s irreplaceable stature and presence, though, has been in all of its essentials captured in Tayo Aluko’s remarkable one-man show titled Call Mr Robeson, which came to Leeds on 16 October. In a mere hour and a half Robeson’s powerful performing abilities, his implacable defence of racial justice and workers’ rights, and his complex personality haunt once more the theatre spaces that Robeson himself so entranced in the middle decades of the twentieth century. Aluko, who wrote and stars in the production, is forced by the lean running time and budget to draw out some aspects of Robeson’s life over others, and in general it’s the political concerns which dominate. 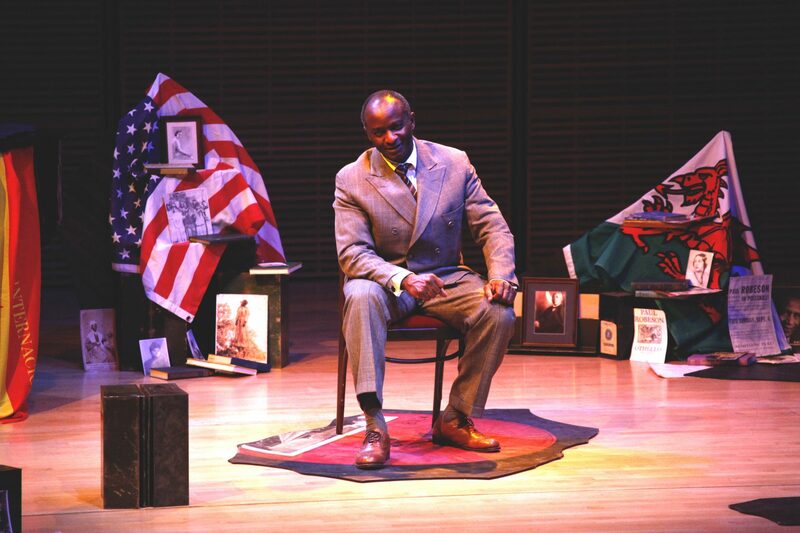 From his first encounter with the cause of the Welsh miners, to his life in Stalin’s Soviet Union, his persecution in McCarthyite America and his Afrocentric racial consciousness, to his latter-day engagement with the American Civil Rights movement, the audience are given a rapid schooling in the numerous aspects of mid-century radical experience that Robeson’s life can shed light on. Nevertheless, Robeson as a character is fleshed out by explorations of and nods to his many personal complexities. His numerous affairs, the very peculiar and turbulent relationship Robeson had with his wife (Eslanda Robeson, a fascinating woman in her own right) and his health problems are either directly addressed or repeatedly alluded to. The narrative of Robeson’s whole dramatic biography is punctuated by brilliantly moving renditions of some of his trademark songs. Indeed, many of the most memorable moments of the show are sung, not spoken. That achievement is all the more marked by the real challenge Aluko faces trying to replicate the unmistakeable bass-baritone voice of the legendary singer. Songs, then, are merely the crowning achievement of what is generally a must-see show. You may have to be patient, though, as funding for this kind of low-key production is only getting harder to obtain. Information on future performance dates of Call Mr. Robeson can be found here.